Behaviors are premades features that can be used to add a specific behaviour to any kind of object. For example, the Physics behavior can be used to add a realistic behaviour to objects. The behaviors used by the object are displayed at the bottom of the list. 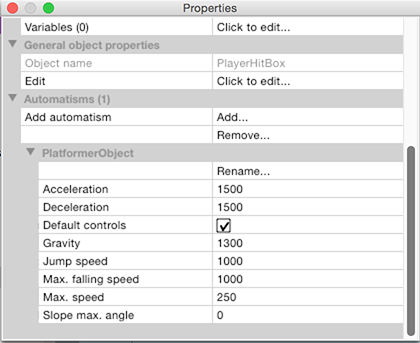 To edit a behavior, simply edit the properties in the list. To add or remove a behavior, use the Add and Remove buttons in the list. When a behavior is added to an object, the behavior is enabled when the scene is launched. You can use the events to enable or disable behaviors of a specific object. For example, it can be useful to disable useless behaviors such as the Light obstacle behavior or Platform behavior, when objects are far from the player. Behaviors can also bring new actions, conditions or expressions: In this case, there will be a new category in the actions or conditions list. Most of the time, you should try to use as much as possible actions or conditions of the behavior: for example, when using the Physics behavior, you should not use the built-in force system to move the object, but rather use the actions provided by the behavior.